A useful Schematic drawing program. 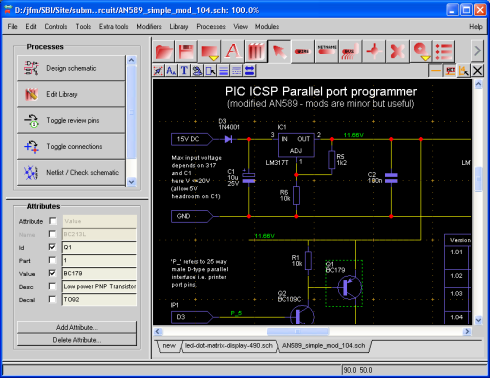 This schematic drawing program is an easy to use schematic capture tool. I use it to create all the schematics and diagrams on this site..
* No limits on schematic size. * No limits on number of pins. * No limits on netlisting. * No limits on library part creation. It displays all the main tools as large buttons at the top of the screen (these are the frequently used tools) and are easier to hit than most other tools with tiny cryptic symbols. With smaller buttons below these (less frequently used tools). Then select the wire tool to make connections between part pins. In addition it has a process box (top left in the picture above) giving you easy access to the functions used in creating a schematic e.g. netlisting which also checks the schematic for various errors. Other processes are bill of materials and auto connection dots. The schematic drawing tool shows attribute data which is data associated with a part e.g. the part number R1 or its value 10k but you can also add your own attributes to any part. A useful feature is the attribute display that shows all the data associated with the current part i.e. you don't have to select different menus to see data such as manufacturer part value (that you may have added) - it's there readily displayed. If you click on the above diagram you'll see the attribute box (at lower left in the picture above) showing the details of Q1 - the currently selected item - it has a Decal of TO92. The library has a large selection of components but if a part does not exist then using library editor to create a new part is very simple. The only difference between drawing in the schematic area and drawing a library part is that you can add a pin element all the other controls are identical to the main schematic editor. So if you can draw in the schematic area then you can easily create new parts. You can then import this into a pcb creation tool... well you might want a few more components though! An unusual feature of the schematic drawing program is that it lets you use layers - normally this feature is used on graphic drawing programs. It's main use here is that you can create background elements that you leave in the background on a different layer and you then set that layer to 'unselectable'. Here the solderless breadboard (and each hole) in the solderless breadboard is a schematic item and these are placed into layer 6 while all the other items are on layer 1 so - you can move wires around without affecting the background. 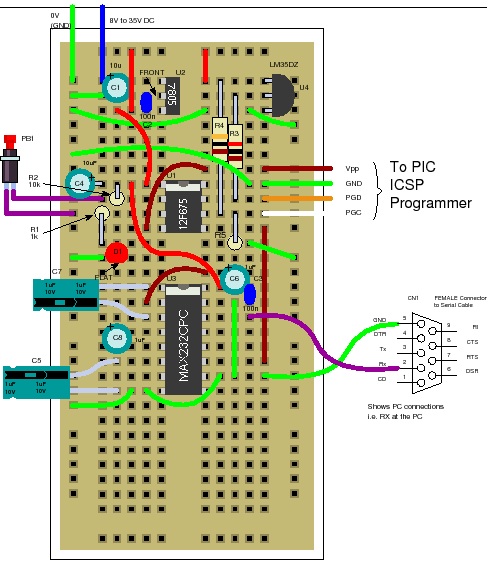 Sign up for MicroZine (the free microcontroller ezine) and you can get the schematics from this site - in ProSchematic format : this gives you a head start in creating your own schematics. End of schematic drawing program page. Jump to schematic drawing software page.